Of the 12 games in South Korea’s popular DJMax series of rhythm games released on PC and Sony handhelds since 2004, only three have made it to North America. Today, we got a fourth. The series’ console debut, DJMax Respect, is out on PS4 today in North America. Maybe I should have waited instead of importing it last year. Nah. I didn’t wait when DJMax Portable, the handheld version of the 2004 PC original, was released back in 2006 for the Sony PSP. The lure of experimental electronic music mixed with anime-style imagery was too much to pass up. When Neowiz (formerly Pentavision) released the first North American version of the game, 2009's DJ Max Fever, I was already way ahead of the curve. 2010's DJMax Portable 3 was released simultaneously in North America and Korea, which was nice. But when 2012's DJMax Technicka Tune for the PlayStation Vita came out in Asian regions three months before the States, I imported once again. And yeah, I’ve been playing DJMax Respect since September of last year. According to DJMax Respect game director Seung-chul Baek, the long-running series has always had a large following in the West, despite most of the games not officially being released here. “We really can’t disclose the exact number of units but we can confidently say that the amount of DJMax games imported to West seem to be about half of Asia sales,” Baek told Kotaku. DJMax Respect’s online and local multiplayer lets players of different skill levels play together. Whatever the actual numbers are, that’s a hefty fraction of sales, mostly made with little or no advertising in Western markets. So why haven’t more DJMax games made it to North America? One of the new game’s hardest, performed by Horie on YouTube. Following the release of DJMax Technika Tune for the Vita in 2012, Neowiz shifted focus to mobile games, which are much easier to release internationally. 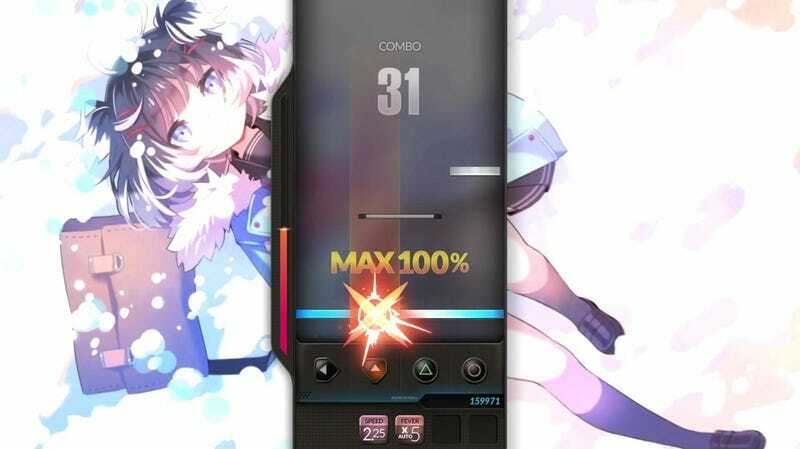 2012's DJMax Ray and 2013's DJMax Technika Q for iOS and Android took up a lot of the studio’s time and energy. “Our plan was to quickly release few titles on mobile and return to console development, but it took a lot longer than we initially expected,” said Baek. But get back to console they did, and in a big way. DJMax Respect for the PlayStation 4 is meant to be a “culminating exclamation point in the series,” created to please all the fans who’ve stuck by the games. While it includes 40 completely new songs (including “Glory Days,” which has quickly become a favorite with fans), the main draw for long-time players is the 107 remastered favorites included on the disc, plus the promise of nearly every song that’s ever been featured in the series eventually being added as downloadable content. I have to wait for the DJMAx Technika 3 DLC pack to play “Angel”. It’ll be worth it. So eventually the the PlayStation 4 game will have all the songs fans love and all the music videos for those songs remastered in 1080P. That’s a game worth waiting for. Even if I didn’t. DJMax Respect is now available for PlayStation 4 in North America for $49.99.